I will never run the full marathon in an Olympic Games, but when I see those athletes there… giving it all… I like to look at them wondering “is there anything we can learn from them? To apply to our running, even if we run half their speed” And the Rio Olympics Full Marathon had two things calling my attention. In the Olympics, what matters is the medal, so the strategy of the strongest is simple: “stay in top group and wait for km X to attack” (strategy of Kipchoge, the winner); those who do not find themselves that strong but with options for the medals, do not have other option than “Stay in the front group, save as much energy as possible, never ever take the lead, and let’s see how many attacks you can resist” (the American Galen Rupp was one of these). But there was one exception to this, which I like a lot: Ghebreslassie, a veteran of these affairs, looks like he had a different approach, his thinking could had been something like this: “Ok, let’s be honest, I’m not in the pick of my level, here there are other runners very strong… I can’t attack them, and most probably if I try to keep their pace and attacks I will be killed… The best time I can afford is a 2:10. The other day, the ladies were off the Olympic record by 5 minutes, if the same happen with us, the winner will be around 2:09 to 2:10. Ok, I’ll do my own run, keep a stable pace so as to finish as close as possible to 2:10, forget about the front group and their fights; perhaps… if they kill themselves… I may have a chance…” His strategy paid off, he disappeared from the head group after the 30km mark when the fight started and the group was reduced to 10 units, but he finished 4th !!! The lesson is clear: be realistic, know yourself and plan your marathon based on your actual possibilities. It is a fact quite discussed and even proved that we don’t have enough reserves in our body to go for a marathon at the top of our capabilities. When you are giving it all, water is not enough, these guys perhaps can finish a marathon in 2:30 only with water, but when they are targeting 2:10, 2:15… they need some fueling on the go; and for that they have those stalls: they are country wise, because each runner is taking there what he specifically needs/uses for their own running. But sometimes I think… do they really need it? Is it playing a key point? A case in point was …. Rupp had problems, started losing contact with the first 2 some 500m before the last of those stalls, as per his running, he was cramping: his running was painful… but then, he reached the stall… took his bottle…. drank…. And magic!! In another 300m his strides came back to normal!! He was back into the fight!!! Re-fueling is an instrument towards performing our best. We need to train for it, know how our body reacts and what we will need and when. And our very own OP Jaisha suffered majorly at the hands of having no hydration or refueling through the entire 42kms of her run at Rio! We have a big lesson to learn, only if we want to! Warmly known as Alfie by runners in the NCR Region, Alfredo is a mentor and a guide, par excellence, to many fledgling and mature runners. 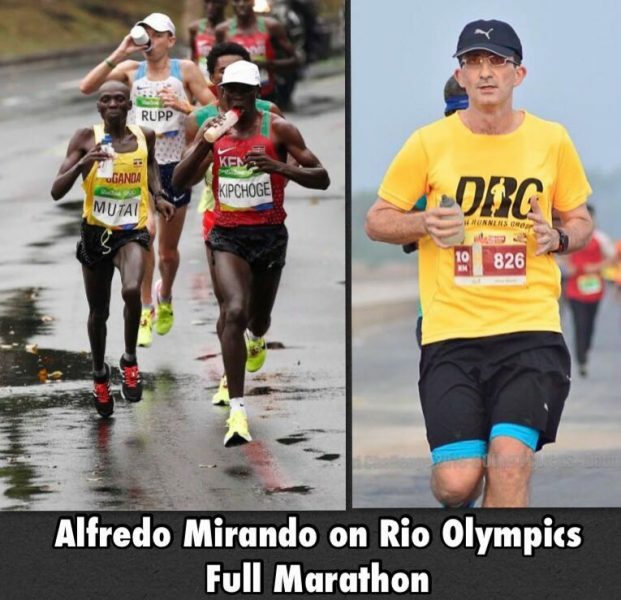 A super marathoner himself, he helps runners with their running plans for various events and most importantly always keeps their morale high up!Alfie lives by the philosophy – The Killing is yet to come, you will see how well you push yourself…He is reachable at alfredo.mirando@gmail.com. Self-Qualification & Self-Restraint! The 2 Truths Runners Must Accept! Honest about Honey! Reasons to try Eucalyptus Honey!